Normally these things don’t matter. The morning after the night before. After the Lord Mayor’s show. Call it what you will, England’s end-of-season jolly against the Barbarians is normally very much a side-show, tagged on to help swell the Rugby Football Union’s [RFU] coffers and remind England’s rugby public “we’re still here”, the day after the really important game of the weekend; the Premiership Final. But these don’t feel like normal times for England or indeed the RFU. A year ago everything seemed so easy. Eddie Jones was struggling to lose as England coach and he was about to watch from afar as his charges formed the nucleus of the British and Irish Lions squad which drew against all the odds with the All Blacks, while his young depleted squad secured a 2-0 series win in Argentina. Sure of selection, buoyed by winning and backed by an apparently unified back-room staff Jones, the RFU and England were flying higher than a set producer on the Magic Roundabout. The RFU was a happy ship again, six years after being dragged through the gutter by the scandal-hit 2011 World Cup shambles. English rugby’s garden was rosy and Jones was proving a hardy perennial, two years after his appointment. Bring on the World Cup, we thought. Bring on the All Blacks. Fast-forward a year and how the picture has changed. Three successive Six Nations losses, the last one a comprehensive 24-15 defeat which handed Ireland the Grand Slam at Twickenham of all places, have seriously tempered expectations. Selection issues are everywhere and the façade of harmony behind the scenes is beginning to creep its way into the public consciousness. The England camp doesn’t appear a very happy place to be. 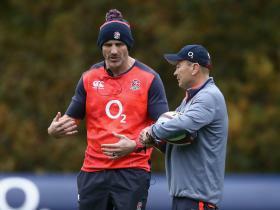 Last week, Paul Gustard became the latest member of England’s back-room staff – and easily the highest profile – to say “thanks but no thanks” to life under Jones when he stood down as national defence coach to take Harlequins’ vacant director of rugby role. England coaches don’t do that nearly a year before the World Cup. Happy ones don’t, at least. Why he jumped is a question only Gustard can honestly answer, but the former Saracens defence coach and man credited with their ‘Wolf Pack’ philosophy has cut an increasingly disenchanted figure around England’s camp in recent times. No longer the animated alpha male he once was, Gustard seemed to have lost his mojo on England’s watch. One thing is clear; Jones is not an easy man to work for. It is not rewriting history to suggest there were concerns when he was appointed that Jones was a two-year coach skilled at energising and reinvigorating teams but unable to sustain the level of intensity he demands of himself, his players and his support staff. A brilliant thinker with an unquenchable thirst for knowledge, Jones can also be brutally honest with his staff and has no qualms about emailing them in the small hours with questions about their role. Wo betide anyone who does not provide a swift response. Working for Jones is an intense experience. After beginning his England tenure with 18 successive wins, Sunday’s game marks the beginning of the most important period of his engagement with the RFU. With his selection policy no longer assured and cracks appearing in his backroom team, the Australian is under-serious pressure for the first time since taking the England head coach’s job in 2015. Set against a backdrop of the damaging recent allegations of sexism within the RFU, of which there is no suggestion Jones is in anyway linked to, and suddenly this game matters a great deal to everyone involved with administering, coaching and playing for the national team. When Jones was caught out describing Wales as a “little s**t place” a week before his side’s last defeat by Ireland, Warren Gatland’s response was pointed and sharp. The Barbarians will present a stern test for an understrength England team – missing their Saracens and Exeter contingent – which presents players the opportunity to boost their claim for a starting place against South Africa in Johannesburg on 9 June. Sunday’s game may not be capped, but in many ways it is as important as any Jones has overseen. There are more unanswered questions now than at any time since he took over. Has England’s bubble burst? Are Jones’s methods sustainable? Can Danny Cipriani ever truly be given a fair crack of the whip? Can England mount a credible World Cup challenge? Is the RFU fit for purpose? No end-of-season jolly, this. This matters a whole lot.